Playing more live games, poker club will be having another $100 deep stack, double blind level game a week after the Superbowl. Superbowl day will have lots of SNGs and cash games at the club so busy there starting with the normal bounty tournament Sat. nite. Then another $50 deep stack at the end of the month. Gotta keep making the final table so I can qualify for the WSOP ME tournament the club has (club send one player to the ME every year). Don't fall asleep during any MTTs!!! LOL that is so true, had it happen many a time! get the coffee brewing!!! - make a final table in a guarantee on FTP! Back to Mtts this month after not playing any since September. Still playing S&G´s, so 50 Mtts in the month will be good. Will try 3 sites, not the big 2. Hope not to be too rusty. Might have needed a bit more volume to properly gauge your skill and results. There are so many MTT players on cc yet only 10 posts and 3 of them are mine? Come on cc guys. we are too busy playing to post in this thread lol. 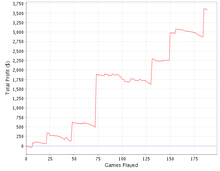 In the past three weeks I've been playing a few MTT's on Stars. This month so far I have played 3 tourneys. 2 were $2 buy-ins and one was a $5. Out of those three tourneys this month, I have made a total of $351 profit. If I include all of my tourneys on Stars (I have only been on Stars since Jan 12) I have played 18 tourneys and made a profit of $901. All at $2-$5 buy-in's. I will now play MTT exclusively on Stars as I now have a comfortable bankroll there (Started with $40 for the League Games), and leave my FTP BR for SNG. 1) Play 10 MTT per week (two per day), Mon through Fri. I know my recent results do not necessarily reflect any future success, but I feel if I can keep up even half this pace then these goals, especially the overall profit goal, are certainly attainable. I will continue to post rail requests whenever I go deep in any MTT, and will keep updating my results each week here in this thread, and daily on my blog. Return to Mtts was pretty, cashed in 2 of 4, one final table. After some months of just STT and poo ROI of 5-8%, MTTs ROI looks soooo sweeeet. Glad to be back, hopely will have the time to keep playing. Random question for Fulltilt players. It is usually pretty darn quick. How long have you waited? I think mine were within a few minutes. Looks like I will be playing a lot of $11 re-buys this month!!!! Not sure why have the idea that will appear instantly. I see a 26 Mtt at noon that have some minutes running and call me to play, so get a couple of tokens but after 15 minutes of wait they not appear, so i give up and better go to other site to play. When look later, tickets where there but i think take around 30-40 minutes to appear (for the time that it say when click in the ticket), will give it a shot later in the week. From this options wich looks better for you (all are $26). I have 3 bullets, if can hit at least one will be nice. Good luck in your rebuys, Deby. ^^^If you want something that you're more likely to convert to $$ play the 45's. If you want something that you're able to convert to "big $$" then play one of the MTTs (33k?). I normally do stick to the 3r/5r's - but have been tempted to throw in some 11's. (I am bankrolled for them). Sat was finally the right day to try one and it worked out well. I will be playing this one every day now. I am way over-rolled now lol. playing the daily dollar tonight. final table please! I'm going to come chime in here even though this thread seems a bit dead. Got six lined up tonight, the $5.50 20k GTD, the $3.30 5K GTD, the 2.20 8k GTD, the $2.75 12.5K GTD, the 1.10 1k cap 1k GTD and the $1.10 4K GTD all on PS. Terrible day so far. Not got far past starting stack on any of the tournaments so far and out of the first 3. In the $2.75 now, lost 300 chips in 20 minutes, and got the $1s starting tomorrow. rough day eh dude? u playin more or u all done? Yeah I'm in two $1 ones if u wana watch. In one now and got another one kicking off in 5 minutes. These are both going much better, double stack in both. Debi I put a bad beat on you but you don't know it yet. Cashed in both my $1's, bubble just burst, here's hoping for a final table run in one! Lol you dont remember when that guy hit the straight on the river in that tourney? Not very much time to play this week, hopely next week schedule will be better. Finished 4th at the club in the $100, 20K stack, 30 min blinds tournament, 50 players, for a $364 + $128 on the $20 LPS chop. Took 12 hours to get that far, what a grind. I think I played very well except for the final hand and even got some comments from some of the other players about how well I played my short stack. I was very card dead most of the middle 2/3 of the game but stayed alive with a few good steals and my rare big hands got paid off to get me to the final table. Next Sunday is a double points tournament so will be back at it again. Thinking about hitting Turning Stone for their March Madness series. started to play more mtts this year ever since i got a couple of big cashes at end of 2010.i play mostly mtts $5 and lower with some $11 mtts here and there. Nice results, gratz on your success. Grats for your results to jilly and JK. Finally i think can play pokaaaa this weekend, gl to all in your games. Anyone else playing tonight? I'm starting a session in 5 GL all! On the final of an $8 On Demand, 5th or better saves the day, 7/9 atm, come onnnn! Day end positive for me. Wasn't even planning on playing this, regged at like 8pm and forgot about it then it popped up at 12pm when I was like 4 tabling and not really feeling it after a bad session so decided to play on - grind grind grind! 5/8 atm just got a walk with like 15BB and had 99, sighhhh! TY John for the rail! Looks like you saved the day! NOW TID!